Below are links to SVG files for the blank Poco Bot design. You can open these vector files in programs such as Inkscape, Open Office Draw, and Adobe Illustrator. Since the original design was first made in Microsoft Office and later ported to Illustrator, you may notice some ghostly anchors that refuse to be deleted! Just work around them. If you would like the template in a different format, let me know! This little paper bot has 6 points of rotation and is made from one sheet of cardstock! You will get good results printing it on 67 lb coverstock as well as 110lb cardstock, or whatever else you may have that qualifies as thick paper. The art and design of Poco Bot is based around the works of my favorite paper artists, some of whom are linked to on the left. Please share what you think about building and playing with your own Poco Bot. 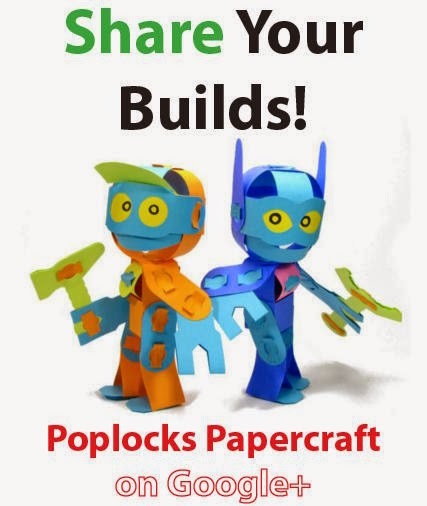 One of my goals is to make my paper models even easier to put together, but that requires your help!